It’s funny how hunger works. We might say we want something desperately, but it sometimes turns out to just represent something else, some deeper need in us. We, the disciples of Jesus, thought we were pretty good at discerning this stuff. After all, we had been with the Master for a couple of years before this particular incident, and had learnt a lot along the way. But really, we were just starting out. The day in question began badly. We had all been rocked by the news that John (the Baptist – not our John) had been beheaded in prison, all because of some stupid drunken promise Herod had made to his wife. It hit Jesus especially hard, because John was his cousin, barely nine months older than himself. It was he who baptised Jesus at the beginning of his ministry, and both of them shared this passion for telling people about God, although they both had very different styles of preaching. John had been all fire and brimstone, while Jesus favoured the more gentle approach. I know which one I, Peter, preferred. Anyway, as I said, the Master was grief stricken, and not a little afraid of the consequences of such brutality catching up with to him. So he did what he always did – went off very early in the morning to be by himself and watch and pray to his Father. We disciples waited some distance away. This was something he had to do alone, regardless of our concern for him. But somehow word had gotten out that he was in the district, and suddenly we were inundated by people desperate to see him. We tried to protect him. In fact I was angry at their intrusion. Jesus needed this time to recover. He shouldn’t have had to deal with other people’s problems as well as his own, and I said as much to him. He simply said, “It’s alright. let them come.” (When had I heard that before?) Then, when they had settled down, he walked among them, touching, healing, and teaching them. It was amazing stuff, but I still fumed. I mean, what did these people want of him? Some sort of miracle they could tell their grandchildren about? A quick healing at the hands of someone whose own needs they really had no regard for? At least, not the way we disciples loved him. After all, we had given everything up to follow him. They would simply go home at the end of this with a spectacular story to tell. We were with him all the time. Nevertheless we waited patiently through the day as he healed and taught – the sort of stuff that we were privy to on a daily basis. Eventually, as it was getting late, I suggested that we send the crowds away into the nearby villages to buy food. It was then that Jesus said, “There’s no need for that. You can feed them.” Well we had indeed brought food for the day, but it only amounted to five loaves of bread and a couple of fish – courtesy of Zebedee, the father of James and John. It might have fed us, but close to 5,000 people….? Impossible! 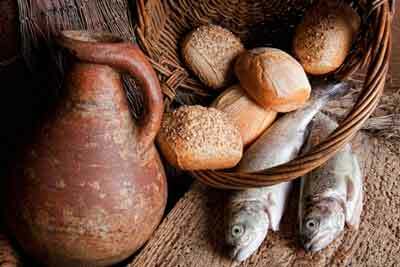 Nevertheless I gave the loaves and fishes to Jesus. He looked up to heaven and gave thanks, then blessed the food and began to break it – again and again and again, until there was more than enough for all. The crowd was then instructed to sit down in groups, and we took the food out to them. And when we gathered up the leftovers afterward, there was enough to feed even more people. We disciples marvelled at this miracle, but still couldn’t see these people as Jesus did. We tended to see them as opportunists, simply getting what they wanted from him, then, hunger satisfied (this time literally), going back home. different eyes to my own, and I wanted to know what that difference was. It took me some time to work it out. It was compassion, and that compassion was fuelled by love. It was love that made it possible for Jesus to take his own suffering (in this case his grief) and transform it into an understanding of the suffering of others, and using it to reach out and touch them where they hurt, to feed them in their hunger. What they made of that didn’t matter to him, although it must of hurt him sometimes to be simply used up. But even that suffering went into more compassion, and so it grew, like ripples in a pond, expanding to fill the whole world. our own filling with the Holy Spirit. This is the food that makes the miracle of multiplication possible. So just as taking food inside us satisfies our hunger and gives us strength, taking the Holy Spirit inside us satisfies all our yearnings and makes possible our reaching out in compassion to a hungry world. But it definitely has to be an inside job.